Arctic foxes must endure a temperature difference of up to 90-100 °C between the external environment and their internal core temperature. To prevent heat loss, the Arctic fox curls up tightly tucking its legs and head under its body and behind its furry tail. This position gives the fox the smallest surface area to volume ratio and protects the least insulated areas. Arctic foxes also stay warm by getting out of the wind and residing in their dens. Although the Arctic foxes are active year-round and do not hibernate, they attempt to preserve fat by reducing their locomotor activity. They build up their fat reserves in the autumn, sometimes increasing their body weight by more than 50%. This provides greater insulation during the winter and a source of energy when food is scarce . In the spring, the Arctic fox's attention switches to reproduction and a home for their potential offspring. They live in large dens in frost-free, slightly raised ground. These are complex systems of tunnels covering as much as 1,000 m2 (1,200 sq yd) and are often in eskers, long ridges of sedimentary material deposited in formerly glaciated regions. These dens may be in existence for many decades and are used by many generations of foxes. The main prey in the tundra is lemmings, which is why the white fox is often called the “lemming fox.” The white fox's reproduction rates reflect the lemming population density, which cyclically fluctuates every 3–5 years. When lemmings are abundant, the white fox can give birth to 18 pups, but they often do not reproduce when food is scarce. The “coastal fox” or blue fox lives in an environment where food availability is relatively consistent, and they will have up to 5 pups every year. Breeding usually takes place in April and May, and the gestation period is about 52 days. Litters may contain as many as 25 (the largest litter size in the order Carnivora). The young emerge from the den when 3 to 4 weeks old and are weaned by 9 weeks of age. Arctic foxes are primarily monogamous and both parents will care for the offspring. When predators and prey are abundant, Arctic foxes are more likely to be promiscuous (exhibited in both males and females) and display more complex social structures. Larger packs of foxes consisting of breeding or non-breeding males or females can guard a single territory more proficiently to increase pup survival. When resources are scarce, competition increases and the number of foxes in a territory decreases. On the coasts of Svalbard, the frequency of complex social structures is larger than inland foxes that remain monogamous due to food availability. In Scandinavia, there are more complex social structures compared to other populations due to the presence of the red fox. Also, conservationists are supplying the declining population with supplemental food. One unique case, however, is Iceland where monogamy is the most prevalent. The older offspring (1-year-olds) often remain within their parent's territory even though predators are absent and there are fewer resources, which may indicate kin selection in the fox. Arctic foxes survive harsh winters and food scarcity by either hoarding food or storing body fat. Fat is deposited subcutaneously and viscerally in Arctic foxes. At the beginning of winter, the foxes have approximately 14740 kJ of energy storage from fat alone. Using the lowest BMR value measured in Arctic foxes, an average sized fox (3.5 kg) would need 471 kJ/day during the winter to survive. Arctic foxes can acquire goose eggs (from greater snow geese in Canada) at a rate of 2.7–7.3 eggs/h, and they store 80–97% of them. Scats provide evidence that they eat the eggs during the winter after caching. Isotope analysis shows that eggs can still be eaten after a year, and the metabolizable energy of a stored goose egg only decreases by 11% after 60 days (a fresh egg has about 816 kJ). Researchers have also noted that some eggs stored in the summer are accessed later the following spring prior to reproduction. The Arctic fox lives in some of the most frigid extremes on the planet, but they do not start to shiver until the temperature drops to −70 °C (−94 °F). Among its adaptations for survival in the cold is its dense, multilayered pelage, which provides excellent insulation. Additionally, the Arctic fox is the only canid whose foot pads are covered in fur. There are two genetically distinct coat color morphs: white and blue. The white morph has seasonal camouflage, white in winter and brown along the back with light grey around the abdomen in summer. The blue morph is often a dark blue, brown, or grey color year-round. 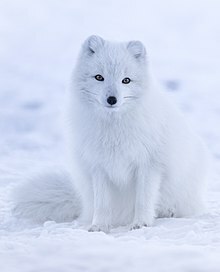 Although the blue allele is dominant over the white allele, 99% of the Arctic fox population is the white morph. The fur of the Arctic fox provides the best insulation of any mammal. The Arctic fox contains advantageous genes to overcome extreme cold and starvation periods. Transcriptome sequencing has identified two genes that are under positive selection: Glycolipid transfer protein domain containing 1 (GLTPD1) and V-akt murine thymoma viral oncogene homolog 2 (AKT2). GLTPD1 is involved in the fatty acid metabolism, while AKT2 pertains to the glucose metabolism and insulin signaling. The average mass specific BMR and total BMR are 37% and 27% lower in the winter than the summer. The Arctic fox decreases its BMR via metabolic depression in the winter to conserve fat storage and minimize energy requirements. According to the most recent data, the lower critical temperature of the Arctic fox is at −7 °C in the winter and 5 °C in the summer. It was commonly believed that the Arctic fox had a lower critical temperature below −40 °C. However, some scientists have concluded that this stat is not accurate since it was never tested using the proper equipment. One way that Arctic foxes regulate their body temperature is by utilizing a countercurrent heat exchange in the blood of their legs. Arctic foxes can constantly keep their feet above the tissue freezing point (−1 °C) when standing on cold substrates without losing mobility or feeling pain. They do this by increasing vasodilation and blood flow to a capillary rete in the pad surface, which is in direct contact with the snow rather than the entire foot. They selectively vasoconstrict blood vessels in the center of the foot pad, which conserves energy and minimizes heat loss. Arctic foxes maintain the temperature in their paws independently from the core temperature. If the core temperature drops, the pad of the foot will remain constantly above the tissue freezing point. 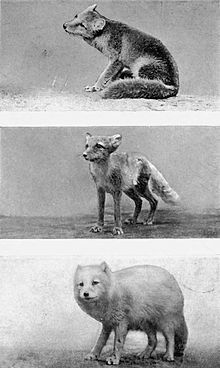 Vulpes lagopus is a 'true fox' belonging to the genus Vulpes of the fox tribe Vulpini, which consists of 12 extant species. It is classified under the subfamily Caninae of the canid family Canidae. Although it has previously been assigned to its own monotypic genus Alopex, recent genetic evidence now places it in the genus Vulpes along with the majority of other foxes. Looking at the most recent phylogeny, the Arctic fox diverged from the domesticated dog (Canis lupus familiaris) at approximately 12 MYA. The Arctic fox and the red fox (Vulpes vulpes) diverged approximately 3.17MYA. Additionally, the Arctic fox diverged from its sister group, the kit fox (Vulpes macrotis), at about 0.9MYA. The origins of the Arctic fox have been described by the “out of Tibet” hypothesis. On the Tibetan Plateau, fossils of the extinct ancestral Arctic fox (Vulpes qiuzhudingi) from the early Pliocene (5.08–3.6 MYA) were found along with many other precursors of modern mammals that evolved during the Pliocene (5.3–2.6 MYA). It is believed that this ancient fox is the ancestor of the modern Arctic fox. Globally, the Pliocene was about 2–3 °C warmer than today, and the Arctic during the summer in the mid-Pliocene was 8 °C warmer. By using stable carbon and oxygen isotope analysis of fossils, researchers claim that the Tibetan Plateau experienced tundra-like conditions during the Pliocene and harbored cold-adapted mammals that later spread to North America and Eurasia during the Pleistocene Epoch (2.6 million-11,700 years ago). The Arctic fox has a circumpolar distribution and occurs in Arctic tundra habitats in northern Europe, northern Asia, and North America. Its range includes Greenland, Iceland, Fennoscandia, Svalbard, Jan Mayen (where it was hunted to extinction) and other islands in the Barents Sea, northern Russia, islands in the Bering Sea, Alaska, and Canada as far south as Hudson Bay. In the late 19th century, it was introduced into the Aleutian Islands southwest of Alaska. However, the population on the Aleutian Islands is currently being eradicated in conservation efforts to preserve the local bird population. It mostly inhabits tundra and pack ice, but is also present in Canadian boreal forests (northeastern Alberta, northern Saskatchewan, northern Manitoba, Northern Ontario, Northern Quebec, and Newfoundland and Labrador) and the Kenai Peninsula in Alaska. They are found at elevations up to 3,000 m (9,800 ft) above sea level and have been seen on sea ice close to the North Pole. The color of the fox's coat also determines where they are most likely to be found. The white morph mainly lives inland and blends in with the snowy tundra, while the blue morph occupies the coasts because its dark color blends in with the cliffs and rocks. During the winter, 95.5% of Arctic foxes utilize commuting trips, which remain within the fox's home range. Commuting trips in Arctic foxes last less than 3 days and occur between 0–2.9 times a month. Nomadism is found in 3.4% of the foxes, and loop migrations (where the fox travels to a new range, then returns to its home range) are the least common at 1.1%. Arctic foxes in Canada that undergo nomadism and migrations voyage from the Canadian archipelago to Greenland and northwestern Canada. The duration and distance traveled between males and females is not significantly different. The Arctic fox is losing ground to the larger red fox. This has been attributed to climate change—the camouflage value of its lighter coat decreases with less snow cover. Red foxes dominate where their ranges begin to overlap by killing Arctic foxes and their kits. An alternative explanation of the red fox's gains involves the gray wolf. Historically, it has kept red fox numbers down, but as the wolf has been hunted to near extinction in much of its former range, the red fox population has grown larger, and it has taken over the niche of top predator. In areas of northern Europe, programs are in place that allow the hunting of red foxes in the Arctic fox's previous range. ^ Merriam 1902, pp. 171–172. ^ "Arctic Fox | National Geographic". Animals. 10 September 2010. Retrieved 28 January 2019. ^ a b Lai, Sandra; Bety, Joel; Berteaux, Dominique (2017). "Movement tactics of a mobile predator in a meta-ecosystem with fluctuating resources: the arctic fox in the High Arctic". Oikos. 126 (7): 937–947. doi:10.1111/oik.03948. ^ a b Gallant, Daniel; et al. (2014). "Natal den selection by sympatric arctic and red foxes on Herschel Island, Yukon, Canada". Polar Biology. 37 (3): 333–345. doi:10.1007/s00300-013-1434-1. ^ a b c d e Noren, K; et al. (2012). "From monogamy to complexity: social organization of arctic foxes (Vulpes lagopus) in contrasting ecosystems". Canadian Journal of Zoology. 90 (9): 1102–1116. doi:10.1139/z2012-077. ^ a b c d Fuglesteg, Britt; et al. (2006). "Seasonal variations in basal metabolic rate, lower critical temperature and responses to temporary starvation in the arctic fox (Alopex lagopus) from Svalbard". Polar Biology. 29 (4): 308–319. doi:10.1007/s00300-005-0054-9. ^ a b c Prestrud, Pal (1991). "Adaptations by the Arctic Fox (Alopex lagopus) to the Polar Winter". Arctic. 44 (2): 132–138. doi:10.14430/arctic1529. JSTOR 40511073. ^ a b c Klir, John; Heath, James (1991). "An Infrared Thermographic Study of Surface Temperature in Relation to External Thermal Stress in Three Species of Foxes: The Red Fox (Vulpes vulpes), Arctic Fox (Alopex lagopus), and Kit Fox (Vulpes macrotis)". Physiological Zoology. 65 (5): 1011–1021. doi:10.1086/physzool.65.5.30158555. JSTOR 30158555. ^ a b c d e f Angerbjörn, A.; Berteaux, D.; Ims, R. (12 November 2012). "Arctic fox (Vulpes lagopus)". Arctic report card: Update for 2012. NOAA Arctic Research Program. Archived from the original on 11 October 2014. Retrieved 6 October 2014. ^ a b c Pagh, Sussie; Hersteinsson, Pall (2008). "Difference in diet and age structure of blue and white Arctic foxes (Vulpes lagopus) in the Disko Bay area, West Greenland". Polar Research. 27 (1): 44–51. Bibcode:2008PolRe..27...44P. doi:10.1111/j.1751-8369.2008.00042.x. ^ MacDonald, David W. (2004). Biology and Conservation of Wild Canids. Oxford University Press. ISBN 978-0-19-851556-2. ^ Bockstoce, John R. (2009). Furs and frontiers in the far north: the contest among native and foreign nations for the Bering Strait fur trade. Yale University Press. p. 41. ISBN 978-0-300-14921-0. ^ a b Truett, Joe Clyde; Johnson, Stephen R. (2000). The natural history of an Arctic oil field: development and the biota. Academic Press. pp. 160–163. ISBN 978-0-12-701235-3. ^ Claudio Sillero-Zubiri, Michael Hoffmann and David W. Macdonald (eds.) (2004). Canids: Foxes, Wolves, Jackals and Dogs Archived 23 September 2015 at the Wayback Machine. IUCN/SSC Canid Specialist Group. ^ "Adaptations by the arctic fox to the polar winter" (PDF). Arctic, vol.44 no.2. Archived (PDF) from the original on 4 March 2016. Retrieved 8 October 2015. ^ Perry, Richard (1973). The Polar Worlds (1 ed.). New York, New York: Taplinger Pub. Co., Inc. p. 188. ISBN 978-0800864057. ^ Lai, Sandra; Bety, Joel; Berteaux, Dominique (2015). "Spatio–temporal hotspots of satellite– tracked arctic foxes reveal a large detection range in a mammalian predato". Movement Ecology. 3 (37): 37. doi:10.1186/s40462-015-0065-2. PMC 4644628. PMID 26568827. ^ a b c Kumar, Vikas; et al. (2015). "Genetic signatures of adaptation revealed from transcriptome sequencing of Arctic and red foxes". BMC Genomics. 16 (585): 1–12. doi:10.1186/s12864-015-1724-8 (inactive 19 February 2019). ^ a b Henshaw, Robert; Underwood, Larry; Casey, Timothy (1972). "Peripheral Thermoregulation: Foot Temperature in Two Arctic Canines". Science. 175 (4025): 988–990. Bibcode:1972Sci...175..988H. doi:10.1126/science.175.4025.988. JSTOR 1732725. ^ Bininda-Emonds, ORP; JL Gittleman; A Purvis (1999). "Building large trees by combining phylogenetic information: a complete phylogeny of the extant Carnivora (Mammalia)". Biol. Rev. 74 (2): 143–175. CiteSeerX 10.1.1.328.7194. doi:10.1017/S0006323199005307. PMID 10396181. Archived from the original on 15 April 2014. Retrieved 30 July 2008. ^ a b Audet, Alexander M.; Robbins, C. Brian; Larivière, Serge (2002). "Alopex lagopus" (PDF). Mammalian Species. 713 (713): 1–10. doi:10.1644/1545-1410(2002)713<0001:AL>2.0.CO;2. Archived (PDF) from the original on 8 June 2011. ^ Larivière, Serge (2002). "Vulpes zerda" (PDF). Mammalian Species. 714 (714): 1–5. doi:10.1644/1545-1410(2002)714<0001:VZ>2.0.CO;2. Archived (PDF) from the original on 23 December 2011. ^ Wang, Xiaoming; et al. (2015). "Cenozoic vertebrate evolution and paleoenvironment in Tibetan Plateau: Progress and prospects". Gondwana Research. 27 (4): 1335–1354. Bibcode:2015GondR..27.1335W. doi:10.1016/j.gr.2014.10.014. ^ Feldhamer, George A.; Thompson, Bruce C.; Chapman, Joseph A. (2003). Wild Mammals of North America: Biology, Management, and Conservation. JHU Press. pp. 511–540. ISBN 978-0-8018-7416-1. ^ "Wildlife". Iceland Worldwide. iww.is. 2000. Archived from the original on 14 April 2010. Retrieved 22 April 2010. ^ "The Arctic Fox Center". Archived from the original on 10 February 2011. Retrieved 19 May 2011. ^ Bolen, Eric G. (1998). Ecology of North America. John Wiley and Sons. p. 42. ISBN 978-0-471-13156-4. ^ Hannah, Lee (2010). Climate Change Biology. Academic Press. p. 63. ISBN 978-0-12-374182-0. ^ Macdonald, David Whyte; Sillero-Zubiri, Claudio (2004). The biology and conservation of wild canids. Oxford University Press. p. 10. ISBN 978-0-19-851556-2. ^ Garrott, R. A.; Eberhardt, L. E. (1987). "Arctic fox". In Novak, M.; et al. (eds.). Wild furbearer management and conservation in North America. pp. 395–406. ISBN 978-0774393652. ^ a b Tannerfeldt, M. (1997). Population fluctuations and life history consequences in the Arctic fox. Stockholm, Sweden: Dissertation, Stockholm University. ^ Goltsman, M.; Kruchenkova, E. P.; MacDonald, D. W. (1996). "The Mednyi Arctic foxes: treating a population imperilled by disease". Oryx. 30 (4): 251–258. doi:10.1017/S0030605300021748. ^ Lönnberg, E. (1927). Fjällrävsstammen i Sverige 1926. Uppsala, Sweden: Royal Swedish Academy of Sciences. ^ Angerbjörn, A.; et al. (1995). "Dynamics of the Arctic fox population in Sweden". Annales Zoologici Fennici. 32: 55–68. Archived from the original on 24 February 2014. ^ "Hazardous Substances and New Organisms Act 2003 – Schedule 2 Prohibited new organisms". New Zealand Government. Archived from the original on 16 June 2012. Retrieved 26 January 2012. Wikimedia Commons has media related to Alopex lagopus. This page was last edited on 23 March 2019, at 22:57 (UTC).